Bennet Hayes is an RTC contributor. He can be found on Twitter @hoopstraveler. For four of the past five years, I have taken a month out of my winter to literally chase college basketball. I have followed it to places large (Lexington, Kentucky, and Lawrence, Kansas), and small (Charleston, Illinois, and Cape Girardeau, Missouri), and along the way I have developed a few favorites. I can tell you that the only thing that surpasses the fervor of college basketball fans in Murray, Kentucky, is their hospitality. I have seen 6th Street in Austin provide as much (and sometimes more) life as the Erwin Center, and I now fully understand why Big Ten teams so rarely leave the Kohl Center victorious. But among all the memorable games and cherished college basketball experiences, one stop has always stood out – Wichita, Kansas. It was my first trip back in 2009, and I had no idea what I was getting into – in more ways than one. Travel fatigue was quickly accumulating (despite it only being week one), and the dark drive from Omaha (where I had watched Drake beat Creighton) on Saturday night was a long one. Wichita was to be but a Sunday stop-over before Bedlam in Stillwater the next day; the fact that the Shockers had a game that day was merely a superfluous reality for this naive traveler. Calling my expectations low would be false. My mind was already on Stillwater, and I had no expectations for Wichita. With the possible exception of Wichita State, there are no earth shattering secrets to reveal about the four teams remaining in the 2013 NCAA Tournament. This Final Four comes packaged with a little bit of everything: the odds-on favorite to win the whole thing (Louisville); a 900-win coach with a legendary zone defense at his disposal (Syracuse); a fifth-place Big Ten team catching fire at just the right time (Michigan); and the Shockers, the barely name-recognizable MVC power whose four-win run has not been given its proper due. It is a fun mix that sets up any number of possible outcomes in Atlanta this weekend. Will Louisville continue its robotic obliteration in the national semifinal and final rounds? 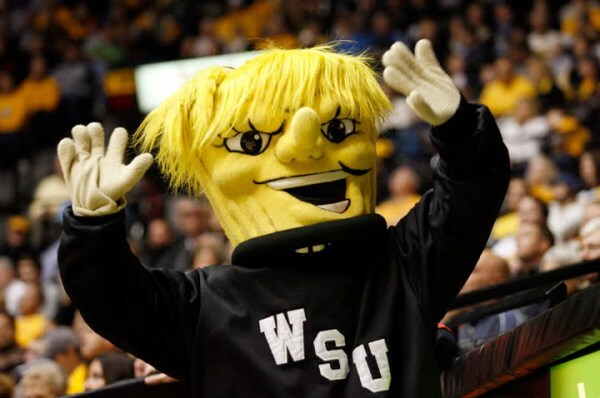 Will Wichita State “shock” (better to get that pun out of the way sooner than later) the college basketball world? Can Michigan’s youth handle the national spotlight? Or will Syracuse’s zone throw two more offenses into utter dysfunction? The Biggest underdog left in the field, Wichita State faces a tough match-up Saturday against Louisville (Getty Images). All of these questions are worth thinking about, but the answers are never as clear as what’s on the surface. Louisville, at the moment, looks like the best team in the country; the Shockers look overmatched. But if you think even for a second analyzing Final Four match-ups is as simple as the above A > B comparison, think again: These games are inherently unpredictable. That’s what makes them fun – what makes this entire Tournament comprise the most entertaining three-week period in American sports. By now you’re well-schooled on each of the remaining participants, but I’m going to try and take you deeper, to dig beneath the superficial qualities that make both match-ups objectively simple to figure out. Here, I’ll take you in different directions, raise hopefully enlightening statistical analysis and maybe, by the end, you’ll have a greater sense of how each team stands going into what should be another excellent weekend of NCAA Tournament hoops. To start off our team preview series, which you can expect each day from now until Friday, the least known commodity on the block, Wichita State, is up to bat. Pre-NCAA Tournament Capsule. One year removed from earning a #5 seed in the NCAA Tournament, a highly successful 27-6 win season and an MVC regular season championship, Wichita State entered 2012-13 with rightfully lowered expectations. You lose your top five scorers from a year ago, enter an overall improved league with an even more improved chief rival (Creighton), and you get the feeling a return trip to the NCAA Tournament maybe just isn’t in the cards this season. This was set up to be a textbook transition year, a season to take inventory and reload for the future. The spoils of 2011-12 – an at-large Tournament berth, regular season conference championship, that kind of stuff – were pretty much off the table. 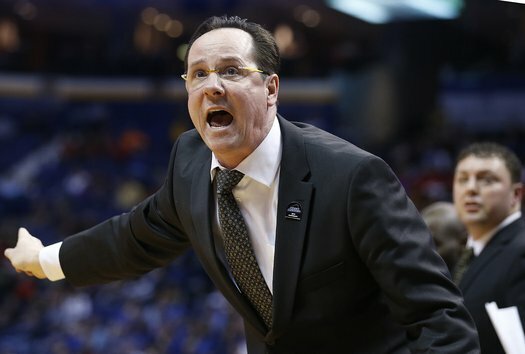 Now Gregg Marshall’s team has not only exceeded last season’s first-round Tourney knockout, but find themselves two wins away from the completely unthinkable: a first-ever national championship. Andrew Murawa is reporting from the West Regional in Los Angeles, CA this weekend. Tekele Cotton Ain’t Scared. To set the scene, a 20-point lead with 11 minutes left had turned into a three-point lead with under three minutes remaining. The Shockers had committed five turnovers on their previous six possessions and hadn’t made a field goal in nearly five minutes. Wichita State players were arguing with each other, looking over at the bench at every loose ball for some sort of help and checking the clock, which was moving far too slow for their liking, at every chance they got. A game that had once been a snoozer looked very much like one that was going to turn into a surprising Ohio State comeback. But after breaking through Buckeye pressure and getting the ball in the halfcourt, the ball found its way to Tekele Cotton with less than ten seconds on the shot clock. Primarily known as a defender and dirty work type of player, Cotton, however, stepped into the three as calm and as cool as you would want, as if the world around him weren’t going to hell. And it was pure. Nothing but net. In that moment, one player putting aside the enormity of the situation and handling his business as if he were all alone in the gym, much of that confusion and disorder disappeared. And he wasn’t done yet. On the next offensive possession, after Fred Van Vleet missed and end-of-shot-clock three on a possession where the Shockers never got the ball inside the three-point line , Cotton tracked down the offensive rebound and turned a wasted 35-second possession into a 1:10 possession that ended in a Van Vleet jumper. Suffice it to say that likely without Cotton, the Shockers may have gotten shocked themselves. Athletically Even. You look at the names of the front of the jerseys and the conferences in which these teams play and you expect, sight unseen, the Buckeyes to be the physically dominant team. That was very much not the case today: Wichita State was every bit the athletic equal of the Buckeyes, with all the height, strength, quickness and bounciness of the more familiar Buckeyes. And you got the feeling right from the start that the Shockers new that. But the Buckeyes are used to playing against their athletic equals on a regular basis, while this was all new for the Shockers. After dominating for 30-some minutes, when the Buckeyes turned up the energy, the Shockers got flustered for a bit, but their athleticism allowed them to recover and fend off a late charge. Aaron Craft Exposed. The game plan for the Shockers on Craft was pretty clear: go under ball screens, give him looks at jumpers over a chance at penetration and go at him with the ball. And their game plan paid off. Craft did his a couple of his seven three-point attempts, but he missed all five of his two-point attempts and was at times a liability offensively, allowing the Shockers to sag off and clog up the lane. And defensively, on more than a couple occasions, Armstead blew by him on the way to the hole. Even more shockingly, when the Buckeyes finally started to show some pop, it was when Craft was on the pine for a brief two minute stretch. He came back on to help harass the Shockers into turnovers late, but this certainly wasn’t a great performance from the Buckeye point. With Florida Gulf Coast’s magical run over, Wichita State is now left to carry the banner for Cinderella in the NCAA Tournament. Having already knocked off Gonzaga, the team that finished the season as the number one team in the polls, the Shockers have experience playing that role, but today they face a team in Ohio State that is as hot as any team in the country, having reeled off 11 straight victories with nine of those coming against NCAA Tournament teams. 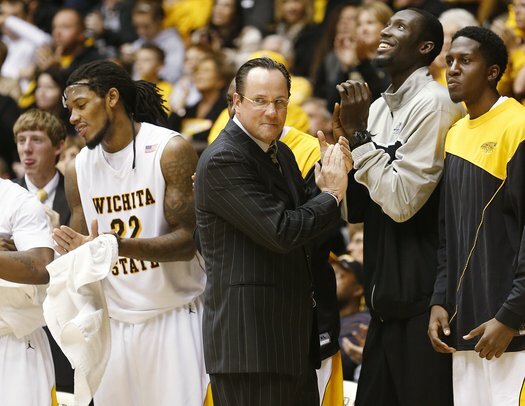 In other words, the Shockers are about to face a big step up in the level of competition. But, you know what? Wichita State belongs on the same floor as the Buckeyes. They’re not going to be over-matched athletically like so many underdogs are, if anything they have a slight height advantage and these Shockers are pretty darn hot themselves right now. They have a quintet of talented guards that as a group can attack the hoop, score from deep and play tremendous defense. And then up front they have a pair of 6’8” bulldogs, with Carl Hall more than willing to mix it up in the paint while Cleanthony Early can be a match-up problem with his inside/outside game. But, as well as Wichita State matches up with the Buckeyes, Ohio State matches up with them. While Early is a strong offensive threat and a tough rebounder, he’s not a real good match-up for Ohio State’s leading scorer DeShaun Thomas – not that very many people are. Thomas has faced far more fearsome defenders than Early, and Gregg Marshall probably knows that he’ll have to run additional defenders at Thomas to get the ball out of his hands. And if the ball is coming out of Thomas’ hands, if these last two games are any indication, that might mean it is going to wind up in LaQuinton Ross’ hands. Ross is Ohio State’s breakout star (he had 14 of the Buckeyes’ last 17 points in their Sweet 16 win over Arizona, including the game winner) and he has shown a versatile offensive game that very few teams in the nation have a great match-up for, and Wichita State is no exception. But, as good as Ross has been these last two games, two fine performances does not make a consistent offensive performer. Andrew Murawa (@amurawa) is reporting from the West Region semifinals in Los Angeles, California, this weekend. No Shock. While Wichita State came into its first two games as underdogs, the Shockers were the favorite on Thursday night. And they played like it. Against a La Salle team featuring a variety of options around the perimeter, the Shockers displayed not only the athleticism and quickness to stick with all of those smaller offensive options, but guys like Carl Hall and Cleanthony Early – both bigger than all but one player in the La Salle rotation – operated with impunity in the middle. Wichita dominated on the glass, grabbing 45.9% of their own misses and 77.9% of La Salle’s, while outscoring the Explorers in the paint 40-26 (a number that was 24-10 at half). The Shockers never trailed and spent the final 36 minutes of the game leading by at least eight points. But Can They Play With The Buckeyes? The Shockers have time and again shown an ability to play with their opponents in this NCAA Tournament regardless of the style of play they face. Against the rugged Pitt Panthers, the Shockers fought them tooth and nail on the glass and dominated them despite shooting just 2-of-20 from deep. Against the high-scoring Gonzaga Bulldogs, Wichita got it done with improbably hot shooting, knocking down 14 threes. And against La Salle they locked up perimeter scorers on the defensive end and pounded it inside on offense. Ohio State is certainly a different animal all together, but this Shockers team has the athleticism at all areas of the floor to compete with the big favorite. Star of the Game. 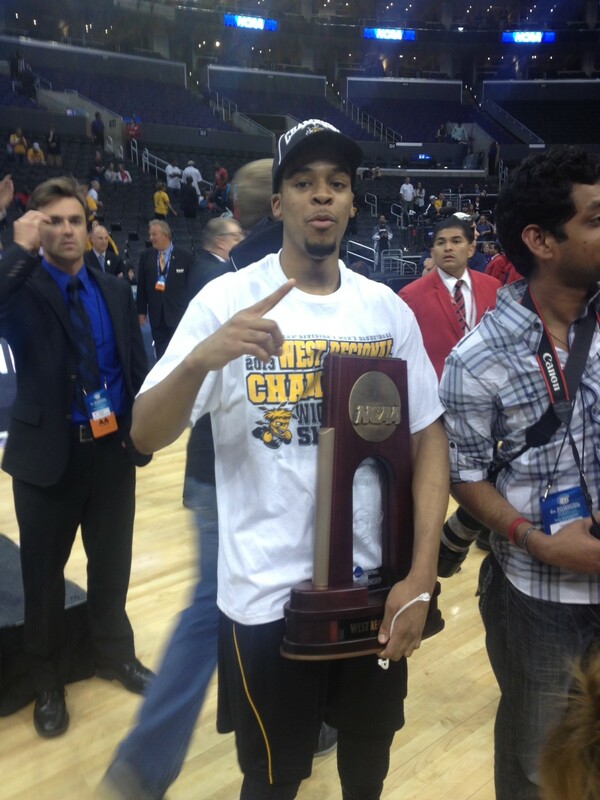 Carl Hall, Wichita State. The newly shorn Shocker big fella controlled the paint tonight, knocking down seven of eight first half shots and grabbing six boards in helping his team build up an insurmountable 16-point halftime lead. While he wasn’t nearly as effective in the second half as the game turned into a guard-dominated affair (he wound up with 16 points, eight boards and three blocks), the damage had been done. Danny Spewak (@dspewak) is an RTC Correspondent. He’ll cover the Missouri Valley Conference Tournament in St. Louis through Sunday. Gregg Marshall loves Gatorade. A lot. During the final minute of Friday’s Missouri Valley Conference quarterfinal victory over Missouri State, the Wichita State head coach downed his second whole bottle of the game with a big, frat party-like chug and then immediately received a third bottle from a manager. That’s a lot of sugar, but you can’t mess with routine. Marshall always carefully places a bottle of Gatorade – with the label peeled off, of course — and a white cup on top of the scorer’s table and then pours the liquid into the cup right before tip-off. Always. No exceptions. His stress level appears to determine how much Gatorade he drinks on a given night. On Friday, that stress level seemed through the roof— from an outsider’s perspective, at least. It’s impossible to know what actually went through Marshall’s head during his team’s 69-59 victory over the seventh-seeded Bears, but this game seemed like the very definition of a “trap game.” Wichita State, the second seed in Arch Madness after losing to Creighton on the final day of the regular season, simply needed to win. It could win ugly. It could win pretty. It could win any way it wanted, but most self-proclaimed bracketologists had the Shockers somewhere in the vicinity of the bubble. Beating Missouri State didn’t change that, but a loss in the quarterfinals might have sounded the alert system in the National Invitational Tournament offices. Injuries aside – and there have been a lot of them this year for Marshall – the Shockers have simply lost too many bad games already. It’s not easy to win on the road in an underrated league like the Valley, but a loss at Southern Illinois and a sweep at the hands of a decent-but-not-elite Evansville team is indefensible. As the calendar turns to March, let us declare: Let the Madness begin. The NCAA Tournament is still three weeks away, but the fight to get there begins in earnest this coming week, as 12 mid-major conferences will kick off their tournaments. The Big South and Horizon League will have the honor of kicking things off on Tuesday night, with their first round tournament games. Ten more conferences will follow suit with the first auto-bids being awarded a week from today in the Atlantic Sun and Ohio Valley. We’ll be back next week with updates on all the action, but until then, there is still the homestretch of the regular season to attend to. 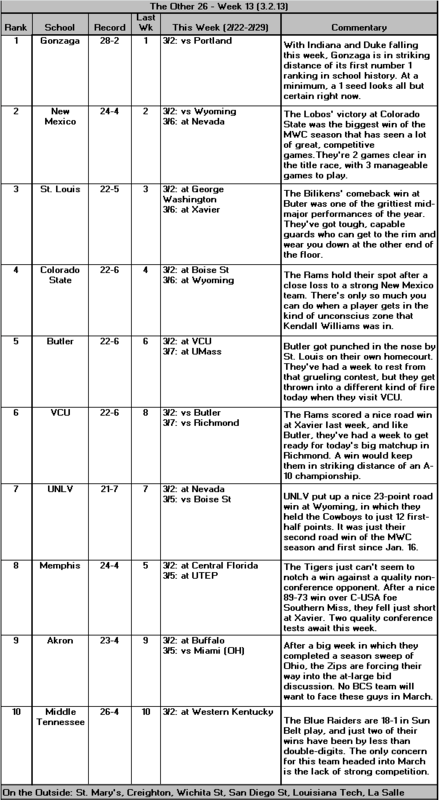 So let’s move on to our updated Top 10 rankings, weekly honor roll, and (regular season) games to watch this week. The Honor Roll is our weekly fixture highlighting the teams, players, and performances that impressed us in the past week. This weekend marks the end of the decade-long Bracketbuster era — or experiment, depending on your perspective. Sadly, if appropriately, it looks like the event will go out with more of a whimper than a bang. Not a single game features a top 25 team, resulting in little hype for this year’s slate. But for true mid-major basketball fans, no top 25 ranking, or lack thereof, is going to dissuade them from devouring the late season, inter-conference action among the country’s best, under-the-radar-until-March teams. Here’s a preview of the five Bracketbuster games we’re most looking forward to, followed by an updated Top 10, our weekly honor roll, and the most compelling non-Bracketbuster games of the coming week. Creighton at St. Mary’s (6 pm, ESPN) — Both teams enter what is perhaps the premier Bracketbuster matchup with a great deal to prove. Creighton’s hot 17-1 start has given way to a rough 5-5 stretch, as the depth of the MVC has taken its toll. In four of those five losses, Creighton’s once unstoppable offense slowed to a pace of less than a point per possession. An at-large Tournament bid remains a safe bet, even with a loss to St. Mary’s, but the Bluejays are no doubt looking to this game to reignite their offense and their season. St. Mary’s, on the other hand, is in desperate need of a quality win for its Tournament resume. 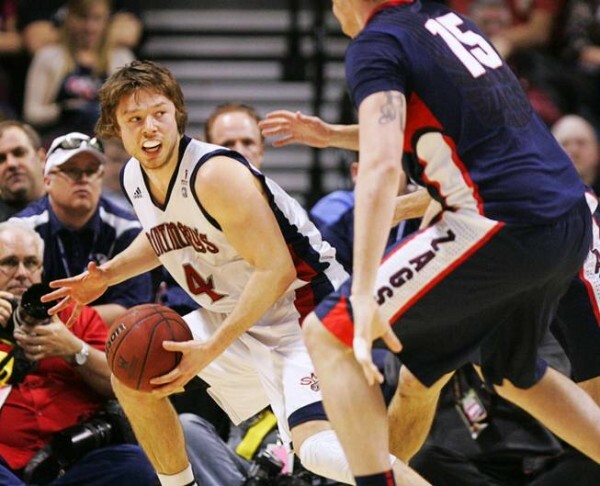 Having been swept by Gonzaga, Saturday’s matchup is a virtual must-win for the Gaels. Both teams have highly efficient offenses that rely heavily on the three-point shot. Whichever defense can step up its game may emerge with the win. Ohio at Belmont (10 pm, ESPN) — This should be a really entertaining game between two teams who love to run and gun. But for the colors of their jerseys, it may be hard to tell the two apart, as the Bobcats and Bruins have remarkably similar statistical profiles. Both are high-possession squads that shoot more than 40 percent of their field goals from three-point range and rank in the top 20 nationally in forcing turnovers. Both have high effective field goal percentages, but rebound poorly and allow their opponents to shoot far more free throws than they do. Toss in a great point guard matchup between seniors D.J. Cooper and Kerron Johnson, and you have the ingredients for a great nightcap to the day’s action. South Dakota State at Murray State (8 pm, ESPN2) — Neither team is as good as it was last season, but both returned their star player. And it’s their matchup at the point guard spot, with Nate Wolters squaring off against Isaiah Canaan, that makes this a must-see game. The two players are the heartbeats of their respective team’s offenses. Each uses roughly 30 percent of all possessions, ranking them in the top 50 in the country. Wolters has been on a particularly nasty tear of late, averaging more than 33 points over his last five games, though two of his 30-plus efforts in that stretch were in defeat. Canaan, meanwhile, is coming off his own 35-point outburst in a win over Morehead State. Detroit at Wichita State (4 pm, ESPN2) — Wichita State has bounced back from a recent three-game swoon with a four-game win streak that includes two close victories over Illinois State and Indiana State this past week. They’ll be the favorites against Detroit, but his game has definite upset potential. Detroit is on the upswing, winning six of their last seven, and developing a potent offensive attack with a multitude of options, from Ray McCallum’s attacking ability to Jason Calliste’s three-point shot to Nick Minnerath’s versatile inside-out game to Doug Anderson’s physical interior play. The Titans will try to push the tempo, while the Shockers will try to slow things down and pound the ball inside to their big men Cleanthony Early and Carl Hall, who may find success against Detroit’s mediocre interior defense. Denver at Northern Iowa (8 pm, ESPN3) — After a rough 4-6 start to MVC play, Northern Iowa has righted the ship and fought its way back to where we thought it would always be — at the top of the league standings, just a step behind Wichita State and Creighton. They face a Denver team that has flown a bit under the radar, recovering from a slow start to the season to win 13 of their last 14 games. A trip to Cedar Falls will be a test of just how far the Pioneers have come. Expect a low-possession, halfcourt-oriented game, with a steady barrage of three-point shots. The Panthers have a balanced attack, with five players averaging between 9 and 13 points. Denver will turn primarily to Chris Udofia, the versatile forward who is the hub of their Princeton offense.